Welcome to the Rewind app! Here, you can find your Vault, where store data and their backups can be viewed and restored in a rewind*. 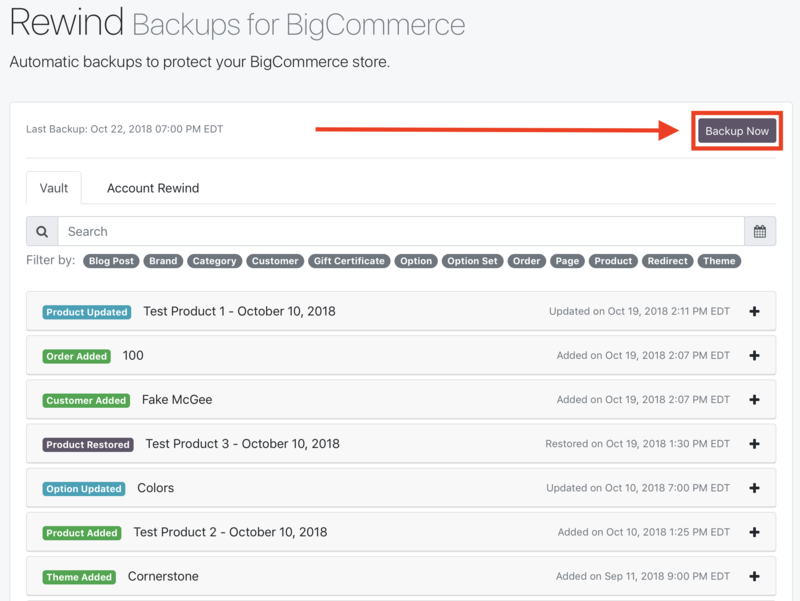 *Note: At this time, you can only rewind Products from your end of the app - but all of the listed data (minus Orders) can be restored in a rewind by contacting us at help@rewind.io. We're working on incorporating the ability for you to perform multiple item, bulk, and full account rewinds from your end of the app - this will be available in the near future! 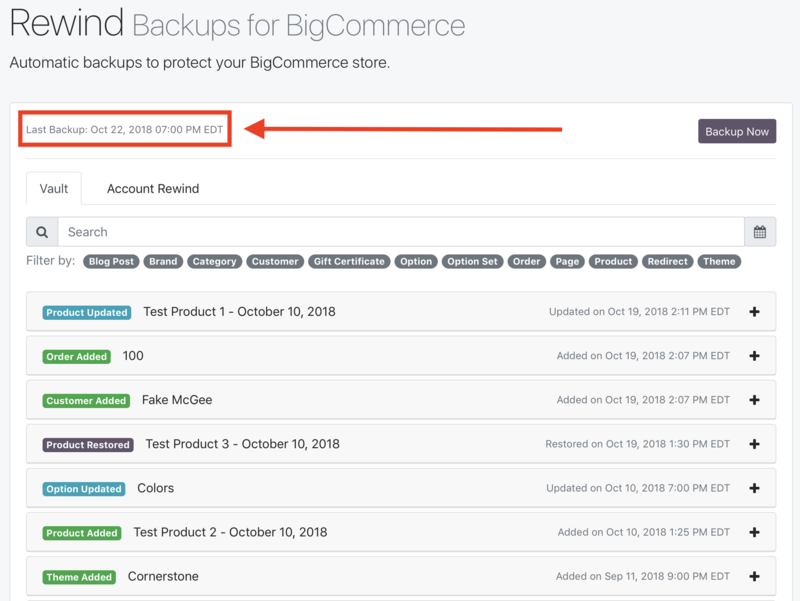 If subscribed to a plan that allows for real-time and manual backups, you will also see that to the right of this, you can also perform a manual store backup by clicking the 'Backup Now' button. *Should you wish to view the data of and/or rewind more than one - or all - of your Products, please contact us at help@rewind.io with this request, and we'd be happy to assist with completing this task. Click here for instructions on viewing/rewinding Products. *Should you wish to view the data of and/or rewind your Options, please contact us at help@rewind.io with this request, and we'd be happy to assist with completing this task. Click here for instructions on viewing/rewinding Options. *Should you wish to view the data of and/or rewind your Option Sets, please contact us at help@rewind.io with this request, and we'd be happy to assist with completing this task. Click here for instructions on viewing/rewinding Option Sets. *Rewind cannot yet rewind/restore Orders. Should you wish to view the backed up data of more than one - or all - of your Orders, please contact us at help@rewind.io with this request, and we'd be happy to assist with completing this task. Click here for instructions on viewing Orders. *Should you wish to view the data of and/or rewind your Customers, please contact us at help@rewind.io with this request, and we'd be happy to assist with completing this task. Click here for instructions on viewing/rewinding Customers. *Should you wish to view the data of and/or rewind your Categories, please contact us at help@rewind.io with this request, and we'd be happy to assist with completing this task. Click here for instructions on viewing/rewinding Categories. *Should you wish to view the data of and/or rewind your Brands, please contact us at help@rewind.io with this request, and we'd be happy to assist with completing this task. Click here for instructions on viewing/rewinding Brands. *Should you wish to view the data of and/or rewind more than one - or all - of your 301 Redirects, please contact us at help@rewind.io with this request, and we'd be happy to assist with completing this task. Click here for instructions on viewing/rewinding 301 Redirects. *Should you wish to view the data of and/or rewind your Blog Posts, please contact us at help@rewind.io with this request, and we'd be happy to assist with completing this task. Click here for instructions on viewing/rewinding Blog Posts. *Should you wish to view the data of and/or rewind your Pages, please contact us at help@rewind.io with this request, and we'd be happy to assist with completing this task. Click here for instructions on viewing/rewinding Pages. *If your store is using Blueprint Themes, you will need to take a few manual steps in order for us to be able to access and back them up. Click here for instructions on viewing/rewinding Themes.